In Christianity, Holy Wednesday, also called Spy Wednesday, or Good Wednesday (in Western Christianity), and Holy and Great Wednesday (in the Eastern and Oriental Orthodox Churches), is the Wednesday of Holy Week, the week before Easter. It is followed by Maundy Thursday (Holy Thursday). In the New Testament account of Holy Week, after Palm Sunday, the Sanhedrin gathered and plotted to kill Jesus before the feast of Pesach. On the Wednesday before his death, Jesus was in Bethany, in the house of Simon the Leper. As he sat at the supper table with his disciples, a woman named Mary anointed Jesus' head and feet with a costly oil of spikenard. The disciples were indignant, asking why the oil was not instead sold and the money given to the poor. But Judas Iscariot wanted to keep the money for himself. Then Judas went to the Sanhedrin and offered to deliver Jesus to them in exchange for money. From this moment on, Judas sought an opportunity to betray Jesus. The Tenebrae liturgy of matins and lauds of Maundy Thursday (Holy Thursday) used to be celebrated in the afternoon or evening of Good Wednesday. The name comes from the Latin word tenebrae, meaning darkness. In this service, all the candles on a special candelabra and on the altar were gradually extinguished except for one. This was then hidden and the church was left in complete darkness. Next, after recitation of Psalm 50 (51) and a special prayer, a loud noise (in Latin strepitus) was made, which was originally a signal for the ministers to depart but was later interpreted as symbolizing the confusion and terror that accompanied the death of Jesus, including the earthquake that, according to the Gospel of Matthew 27:51, followed. A similar celebration of matins and lauds of Good Friday and Holy Saturday used to be held towards the close of each of the preceding days. This tradition was abandoned in the 1950s. Today the term "Tenebrae" is applied to a variety of services inspired by it, not necessarily connected with Holy Week; these usually involve the gradual extinguishing of candles and the strepitus. Assist us mercifully with thy help, O Lord God our salvation, that we may enter with joy upon the meditation of those mighty acts through wich thou hast given unto us life and immortality; through Jesus Christ our Lord. Amen. On the evening of Spy Wednesday, many Methodist churches observe the Tenebrae service. In the Protestant Episcopal Church in the United States, a member of the Anglican Communion, the Tenebrae service is celebrated on Spy Wednesday. In the Byzantine Rite, the theme of Holy and Great Wednesday is the commemoration of the sinful woman who anointed Jesus before his crucifixion and Burial; a second theme is the agreement to betray Jesus made by Judas Iscariot. Service of the Sacrament of Holy Unction. O Lord, the woman who had fallen into many sins, sensing Your Divinity, takes upon herself the duty of a myrrh-bearer. With lamentations she brings you myrrh in anticipation of your entombment. "Woe to me!" she cries, "for me night has become a frenzy of licentiousness, a dark and moonless love of sin. Receive the fountain of my tears, O You who gather into clouds the waters of the sea. Incline unto me, unto the sighings of my heart, O You who bowed the heavens by your ineffable condescension. I will wash your immaculate feet with kisses and dry them again with the tresses of my hair; those very feet at whose sound Eve hid herself in fear when she heard You walking in Paradise in the twilight of the day. As for the multitude of my sins and the depths of Your judgments, who can search them out, O Savior of souls, my Savior? Do not disdain me Your handmaiden, O You who are boundless in mercy. The Byzantine musical composition expresses the poetry so strongly that it often leaves many people in a state of prayerful tears. The Hymn can last upwards of 25 minutes and is liturgically and musically a highpoint of the entire year. In Greece (and some other places the custom has spread to) all members of the church receive Holy Unction on Wednesday evening. It is on account of the agreement made by Judas to betray Jesus on this day that Orthodox Christians fast on Wednesdays (as well as Fridays) throughout the year. Czech Republic: the day is traditionally called Ugly Wednesday, Soot-Sweeping Wednesday or Black Wednesday, because chimneys used to be swept on this day, to be clean for Easter. Malta: this day is known as L-Erbgħa tat-Tniebri (Wednesday of Shadows), referring to the liturgical darkness (tenebrae). In the past children went to the parish church and drummed on the chairs to make the sound of thunderstorms, as their version of the "strepitus" sound at Tenebrae Wednesday. Scandinavia: this day is known as Dymmelonsdagen. A dymbil is a piece of wood. Historically, the metal clapper of the church bells were replaced by these dymbils on Holy Wednesday, to make a duller sound. Although the consensus of modern scholarship is that the New Testament accounts represent a crucifixion occurring on a Friday, a growing body of commentators claim the traditional Holy Week calendar is inaccurate and Jesus was crucified on Wednesday, not Friday. In a review of Colin Humphreys's 2011 The Mystery of the Last Supper, W.R. Telford noted that Humphreys used some very dubious sources and built an argument upon unsound premises. Those promoting a Wednesday crucifixion date instead of Friday argue that Matthew 12:38–40 (ASV) indicates Jesus was to be dead for "three days and three nights," which would not have been possible if he was crucified on a Friday. Elsewhere Biblical texts reinforce the point that Jesus was to be dead for three days and three nights, including in Mark 8:31, where it is written that the Son of Man "must be killed and after three days rise again." In Matthew 27:62–64 the Pharisees quote Jesus as saying, "After three days I will rise again." Others have countered by saying that this ignores the Jewish idiom by which a "day and night" may refer to any part of a 24-hour period, that the expression in Matthew is idiomatic, not a statement that Jesus was 72 hours in the tomb, and that the many references to a resurrection on the third day do not require three literal nights. Other evidence weighing against the Wednesday crucifixion hypothesis comes from Jesus stating that he would rise on the third day, not after three days (Matthew 16:21, Matthew 17:23, Matthew 20:19, and Luke 24:46 NRSV). The crucifixion's proximity to the Sabbath day has also factored into the theory. Mark 15:42 indicates that Jesus was crucified on "Preparation Day (that is, the day before Sabbath)." Since the Sabbath occurs on Saturday, it was presumed that Jesus was crucified on Good Friday. The Wednesday Crucifixion theory accounts for this by translating (μεγάλη ἡ ἡμέραJohn 19:31 as a special sabbath or High Holyday. Proponents of the Wednesday crucifixion theory argue that this special Sabbath was the Feast of Unleavened Bread, which commenced on the 15th day of the Jewish month of Nisan and was preceded with a passover meal on the 14th of Nisan. If Jesus was crucified in 30 A.D. or 31 A.D., the 14th of Nisan would have fallen on a Wednesday, with the next day being an Annual Sabbath. Modern versions of Matthew 28:1 record the resurrection as occurring "After the Sabbath, at dawn on the first day of the week." But the Greek text reads "After the Sabbaths" (plural), meaning two Sabbaths had passed between the crucifixion and resurrection of Jesus – the annual Sabbath and the weekly Sabbath. A Thursday crucifixion has also been proposed. ^ McKim, Donald K. (1996). Westminster Dictionary of Theological Terms. Westminster John Knox Press. p. 269. ISBN 9780664255114. Spy Wednesday: The Wednesday of Holy Week, so named from its being the day on which Judas Iscariot betrayed Jesus Christ (Matt. 26:14–16). ^ Halsey, William Darrach (1981). Collier's Encyclopedia with Bibliography and Index. Macmillan Educational Corporation. 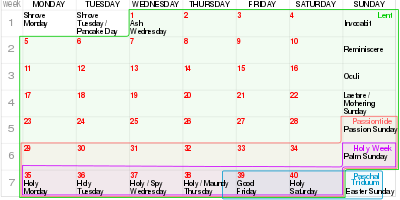 Among English-speaking peoples the Wednesday of Holy Week is called variously Good Wednesday, Holy Wednesday, Spy Wednesday (referring to the activities of Judas Iscariot), and Wednesday before Easter. ^ Oppenheimer, Mike. "The Betrayer Judas Iscariot". Let Us Reason Ministries. Retrieved 27 March 2013. ^ "spy, n.", OED Online, Oxford University Press, December 2013, retrieved 15 Dec 2013, Spy Wednesday n. in Irish use, the Wednesday before Easter. ^ Packer, George Nichols (1893), Our Calendar: The Julian Calendar and Its Errors, how Corrected by the Gregorian, Corning, NY: [The author], p. 112, retrieved 15 Dec 2013, Spy Wednesday, so called in allusion to the betrayal of Christ by Judas, or the day on which he made the bargain to deliver Him into the hands of His enemies for thirty pieces of silver. ^ McNichol, Hugh (2014). "Spy Wednesday conversion to Holy Wednesday". Catholic Online. Retrieved 10 May 2014. ^ "spy". Oxford English Dictionary (1st ed.). Oxford University Press. 1933. ^ "The Liturgy of Tenebrae". Jesuit Institute. Retrieved 2018-07-09. ^ a b The Book of Worship for Church and Home: With Orders of Worship, Services for the Administration of the Sacraments and Other Aids to Worship According to the Usages of the Methodist Church. Methodist Publishing House. 1964. p. 101. Retrieved 25 March 2017. ^ Book of Occasional Services. Protestant Episcopal Church in the United States. 2018. In this book, provision is made for Tenebrae on Wednesday evening only, in order that the proper liturgies of Maundy Thursday and Good Friday may find their place as the principal services of those days. ^ Ashley, Scott. "Jesus Wasn't Crucified on Friday or Resurrected on Sunday". The Good News Magazine of Understanding. Retrieved 27 February 2012. ^ Humphreys, Colin (2011). The Mystery of the Last Supper: Reconstructing the Final Days of Jesus. Cambridge University Press. ISBN 052173200X. ^ Telford, William R. (2015). "Review of The Mystery of the Last Supper: Reconstructing the Final Days of Jesus". The Journal of Theological Studies. 66 (1): 371–376. doi:10.1093/jts/flv005. ^ Akin, Jimmy (21 April 2011). "The Crucifixion: Wednesday or Friday?". The National Catholic Register. Retrieved 11 March 2012.